Curse? What curse! Real Sociedad away is a fixture where FC Barcelona have typically stumbled over the last decade. The Liga win last season was the first after seven failed attempts in San Sebastian. This Saturday afternoon, Barça did it again! And as in last year’s 4-2 victory at Anoeta, they did it the hard way by fighting back from behind. 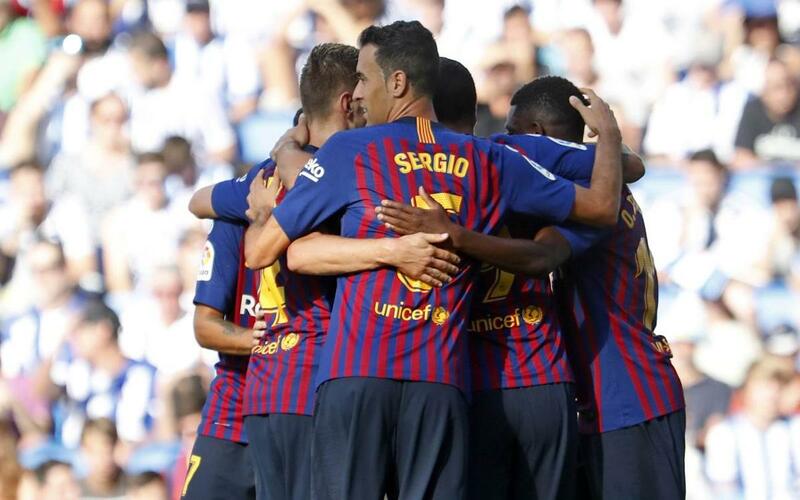 That’s a perfect twelve points from the first four Liga games this season, and sets things up nicely for the Champions League debut against PSV Eindhoven on Tuesday. In their redesigned stadium, now minus one athletics track, the home fans were in good song for their first home game of the season, and were rewarded with a goal after just 12 minutes. Aritz Elustondo latched onto a flunked clearance and slammed home a solid left-footed strike. To be fair, they were good value for their lead. The first 45 minutes saw very little real threat from Barça – a Gerard Piqué header from a corner being the closest they came to scoring. The same player was at the centre of some VAR drama towards the end of the half. It looked like he could have been tugged to the ground, but the video evidence was presumably not deemed conclusive enough to award a penalty. Ernesto Valverde tried to shake things up by sending on Philippe Coutinho followed by Sergio Busquets, but it was the Basques who had three quick chances to stretch their lead. Poor finishing and top goalkeeping from Ter Stegen ensured that they did not. But just when they were struggling the most, Barça finally found the net. A scrappy scuffle in the Real six-yard box ended with the ball flying straight into the path of Luis Suárez, who just had to volley home the gift and we were back level! The goal breathed new life into the team, and within a couple of minutes, they were leading. A headed clearance only went as far as Ousmane Dembélé, and the Frenchman rammed in Barça’s second, and his third goal in as many games. But this was by no means over. Real, and particularly Juanmi, had enough opportunities to sneak a goal back in the dying minutes and will feel frustrated that they didn't have at least point in return for all their effort. But they didn’t take their chances, and Barça did. And if you can have something of an off-day and still end up winning, then that’s a very positive sign indeed. Especially with someone like Marc-André Ter Stegen in goal!